This past week the weather was a bit inconsistent and the bite was changing daily. On Wednesday it was close to 90-degrees and by the weekend it was cold and windy with a chance of thunder storms. 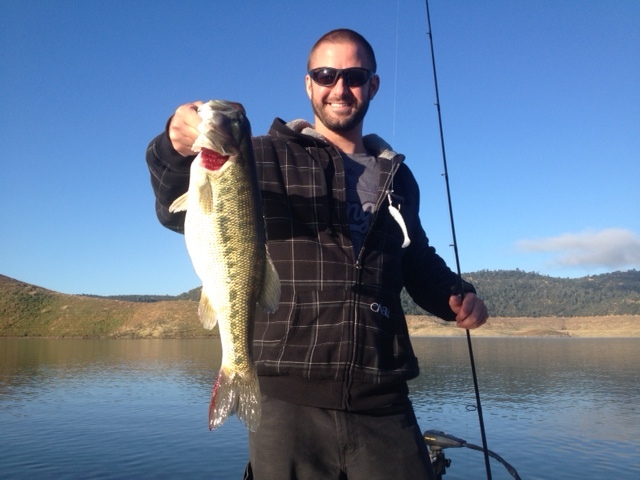 The cooler weather seemed to bring some quality fish back toward the shoreline. On Sunday morning we were faced with some post front conditions, but the bite ended up being really good. We started out tossing small topwater baits that had been working extremely well last week. After fishing a few key areas and not getting any bites we quickly changed gears and slowed down. We switched to soft plastic presentations that we could fish on the bottom and in the middle water column. It didn’t take long to find that our decision to change was a good one. First cast Jeffrey put a nice spot in the boat and couple casts later he hooked into a big one. The fish bolted toward the brush, came out of the water a couple times and then surged to deep water. After putting up a great fight we finally netted this 5-pound spotted bass. We move on and fish some other productive areas and caught fish on each stop. 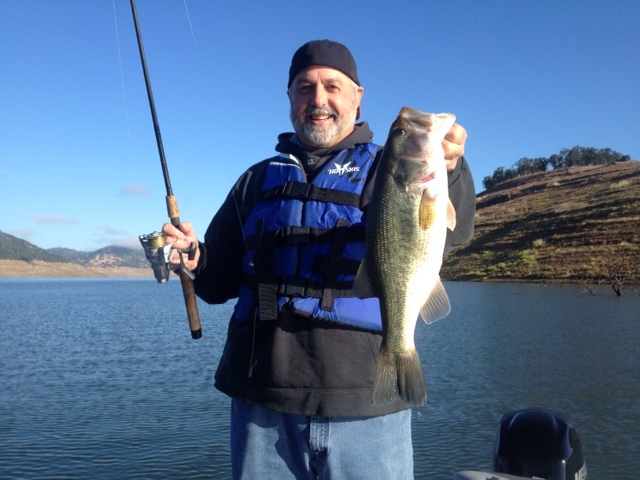 We pulled up to some main lake structure and Jeff was fishing a bottom bouncing presentation with bluegill patterned worm when he hooked into this chunky 4-pound largemouth. It turned out to be a very successful fishing Xperience and Jeff and Jeffrey boated over 20-fish on this morning 1/2-day outing. On Saturday February 13th, 2016 we hit the water with one goal in mind. That goal was to learn how to find and catch trophy sized fish. 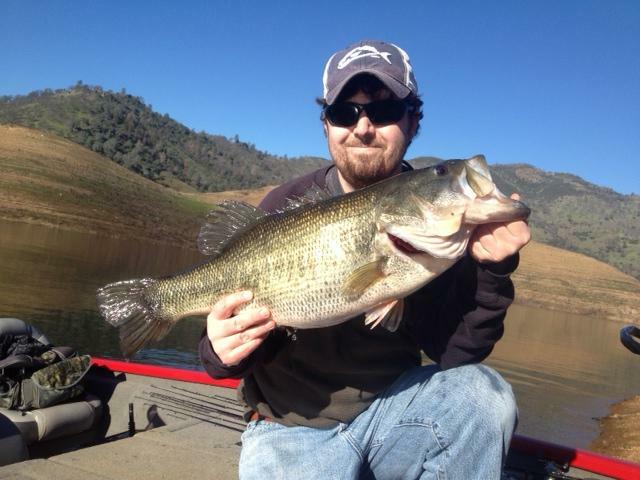 Peter Haskin of Escalon has fished for bass for most of his life. Catching a double-digit fish was a dream, and at 8:56am in the morning his dream came true. We started the day tossing over-sized baits that would appeal to only the largest fish in the lake. We made a couple stops and had a bit of activity. Our hopes were high and the fish seemed to be responding well to our approach. As we drifted quietly to our next spot, neither one of us knew exactly what was about to take place. The first cast Peter made he hooked a nice one. It put a bend in the rod, came unbuttoned and left us with a just swirl on the surface. Knowing we would have very few opportunities we were slightly disappointed. That feeling didn’t last long. Two casts later, I looked off in the distance and noticed a huge shadow. The moment I realized it was a fish and was tracking our lure, it hit! Peter swung and hooked into an absolute giant. The fish buried down and refused to come up. Peter kept constant pressure and worked the fish right into the net. We did it! That is a fish of a lifetime! We carefully placed her in the livewell and gathered our composer. After weighing her at 11.02-pounds and taking a few photos we released her back into the lake. It was great day on the water and an amazing fishing Xperience.